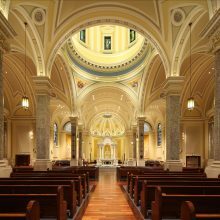 Plaster was commonly used in many luxury residences, public buildings, and churches as interior finishing material during the 19th and early 20th centuries. Plaster consists of lime or gypsum powder, and water. Mixed properly, it forms a thick paste that is applied over brick, thin strips of wood lath, or wire mesh. After curing, elaborate artwork, murals, wallpaper, stenciling, or other decorative finishes can be added. 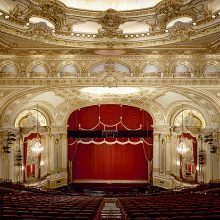 In many historic buildings, plaster was used for domes, crown moldings, rosettes, medallions, cornices, rails, mantels, plaques, columns, and capitals. Over time, plaster may get brittle and slowly deteriorate, first forming fine lines, then larger cracks, ultimately resulting in the loss of intricate details or entire ornamental elements. 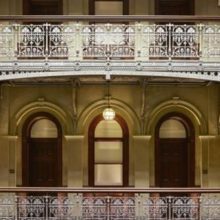 Our plaster studios in New York & Los Angeles employ a diverse group of experts in plaster restoration, replication, repair, plaster fabrication, and historic preservation of decorative and ornamental plasterwork. 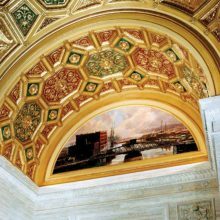 Trained in traditional sculpture, mold making and casting techniques, our plaster specialists design, fabricate and implement any type of plasterwork, including architectural sculpture and bas relief, Venetian plaster and scagliola. Plaster has also enjoyed a strong comeback in modern interior architecture. Especially Venetian plaster has become a popular contemporary plaster finish for commercial buildings, retail environments, and luxury residences.